Salt bath furnace｜KYK - KANTO YAKIN KOGYO CO.,LTD. ●1967 Started sale of Salt bath Furnace. with capacity of 100 tons. equipment based on the know-how gained since 1967. Please try KYK's Salt bath Furnaces. Heating without contacting air is possible, preventing oxidation and decarburization. 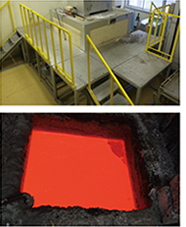 furnace to the quench oil bath or water bath, oxidized scale and decarburization do not take place. Easy to uniformly heat the whole workpiece. Easy to control heating temperature by keeping the bath temperature. Each portions in complicated shapes can be uniformly heated in a short time. Easy to support and move the workpiece in the furnace. Partial heating of workpiece is also possible. Quenching of high-speed tool steels. and aircraft control radar parts.